So you’ve just opened up your new deep fryer, purchased drums and drums of oil, and everything you have always wanted to try fried. The question then comes, now what? Man cannot deep fry with fryer and oil alone! Besides, we get accessories for all of our favorite devices. 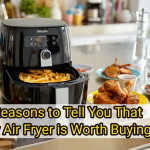 Cell phones get cases, and cars have a nearly infinite list of add-ons and enhancements, why not thee deep fryer? 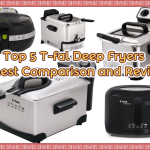 There are several deep fryer accessories that the fryer should consider. 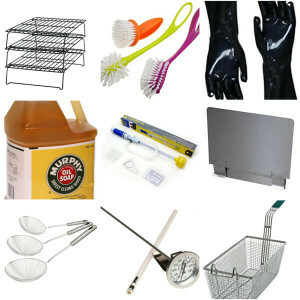 These accessories will help make the whole process of frying easier, cleaner, safer, and better. 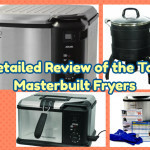 That being said we’ve assembled a list of nine deep fryer accessories that you should consider. First and foremost among accessories that any deep fryer should have is a basket. A basket is almost an essential part of any frying kit. The basket holds your food while it is being cooked. More than that, the basket lets you take your food out of the fryer without having to poke at it while it is bubbling in hot oil or scoop it out with a spoon, which can get oil everywhere and risks being burned. 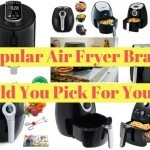 There are many types of baskets, you should select one that is the same shape as your fryer, so if your device is round buy a round basket, rectangular if your device is rectangular, etc. Baskets also come in differing levels of fineness, with coarse baskets having large holes and finer mesh baskets having smaller holes. You should select the mesh for your basket based on the size of the food you plan on frying. A skimmer is another useful tool that performs a similar function to the basket. 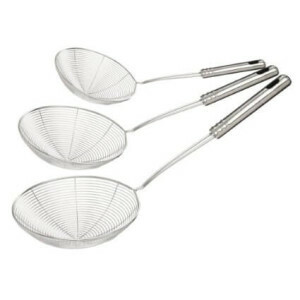 A skimmer is a screen, either coarse, medium, or fine, that is attached to a handle and used to remove food from the fryer. The difference between a skimmer and a basket is that while a basket sits in the fryer while it is being used a skimmer rests outside the fryer. The skimmer is incredibly useful if you are frying more than one batch or want to take out food items individually when they are done. 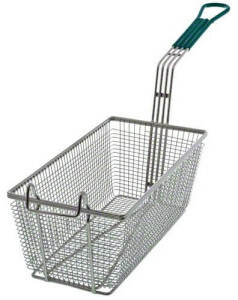 It saves you from having to lift the basket out each time you want to remove something, which also cuts down on the mess. The splash guard is a must have for anyone who loves fried food but is also a neat-freak. 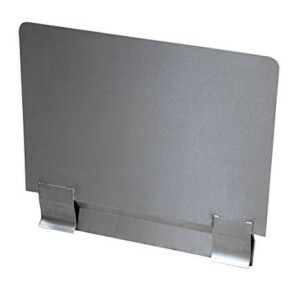 The splash guard works to minimize the amount of oil that splashes out of the fryer during the course of regular use. In addition to preventing hot messy oil from getting onto your counter or floor, splash guards are also easy to clean, usually made of a surface that can just be wiped off. 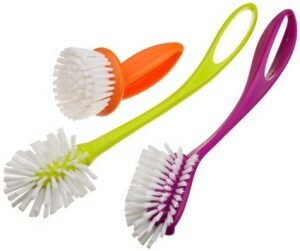 This makes cleaning up after you are done a breeze and acts as a huge time saver. Every cook knows that in order to get the best tasting food you have to be able to control the temperature it is cooked at. It is fairly hard to control the temperature, however, if you do not know what it is. This is more common than it should be when it comes to fryers as most fryers do not have an accurate temperature setting but rather have a scale of heat intensity such as 1-10 or a gradually thickening bar. As such a thermometer is a handy deep fryer accessory to have around. 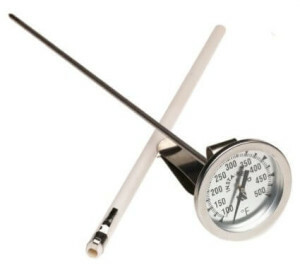 Some advice when choosing a thermometer; it is important that the thermometer be taking the temperature of the oil rather than the temperature of the vessel cooking the oil. In light of this thermometers that attach to the side of the fryer and hover in the middle or ones that have an appropriately sized probe are ideal to maintaining the precision that is the key to great food. Mitts are an important piece of protective gear that one should use whenever they are cooking, and deep fryers are no different. Mitts are made of heat resistant fibers and cover the hand and upper part of the arm. 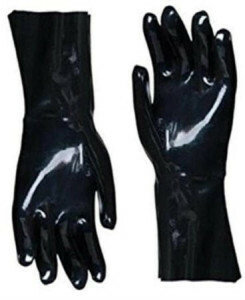 Not only does this protect your hand from contact with the hot metal basket, but it also shields you from splashing and bubbling hot oil which you might not see coming. As such the mitt is an important accessory in order to prevent burns. Mitts aren’t just useful in the operation of the fryer though, if you need to clean the fryer in a hurry and do not have time to let it cool mitts are your best friend! 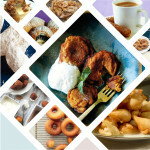 One of the most intimidating aspects of operating a deep fryer is the high cost of the oil needed to supply it. 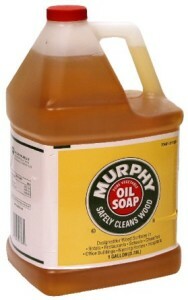 An oil pump and filter can save you money by cleaning your oil so that you can get more use out of it. 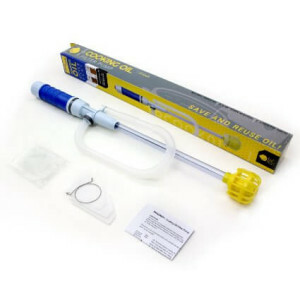 In addition to saving you money, the clean oil the pump and filter produces means that you will have clean tasting food. This is especially important as no deep fry enthusiast wants to taste a combination of all the things they’ve made recently when they pull their tasty treat out of the fryer. 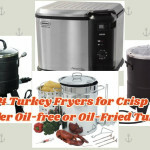 While the pump and filter help keep your oil clean, you also want to make sure the fryer itself stays in tip top shape. 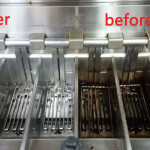 There are many commercial cleaning products that can help break down the oil residue left in your fryer to make so that it can be properly cleaned. These solutions work like specialized soaps that help get the grease and oil off while protecting the parts and components of the fryer itself. 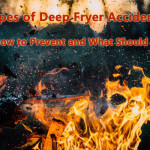 Failure to clean and maintain your fryer can not only lead to costly replacements, but also creates a risk of a fire. 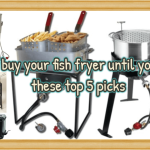 Solution isn’t the only thing that can help you keep your fryer in top working order. There are also brushes that can help you scrape away burn bits of food from the sides and bottom of the fryer without damaging it, and also help you get to those other hard to reach places. The brushes also can prevent accidental burns that can come from trying to clean the fryer when it is too hot or if it accidentally gets turned on during the cleaning process. Even the best fryer in the world cannot do anything about the remaining oil that is on food after it is taking out of the fryer. Food straight from the fryer is also incredibly hot. If you just place it on a plate to cool then the food you are so looking forward to will sit in a puddle of oil and grease, greatly reducing its quality. The solution to this conundrum can be found in a cooling rack. 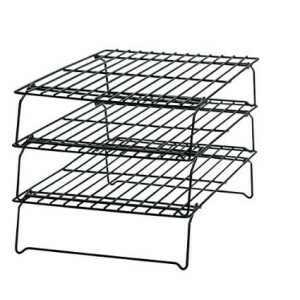 Cooling racks are made of wire and are designed to hold your food while it cools down. Cooling racks have space underneath them to allow for excess oil to drip off, and the wire construction of them means the food gets greater surface area exposure, letting it cool down to a consumable temperature much more quickly. As you can see, your journey to a wonderful fried snack does not begin and end with your purchase of the fryer and oil. 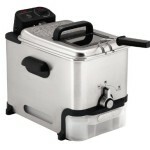 There are many deep fryer accessories that make operating your fryer safer, easier, and faster. 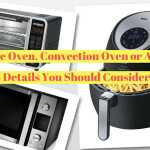 There is never any reason to make something harder or more dangerous than it has to be, and with these accessories you will be well on your way to easy, delicious fried foods. 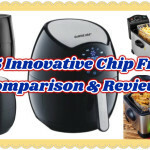 Any other deep fryer accessories you think should be appear here, just let me know in the comments section below and I’ll have a look at it.